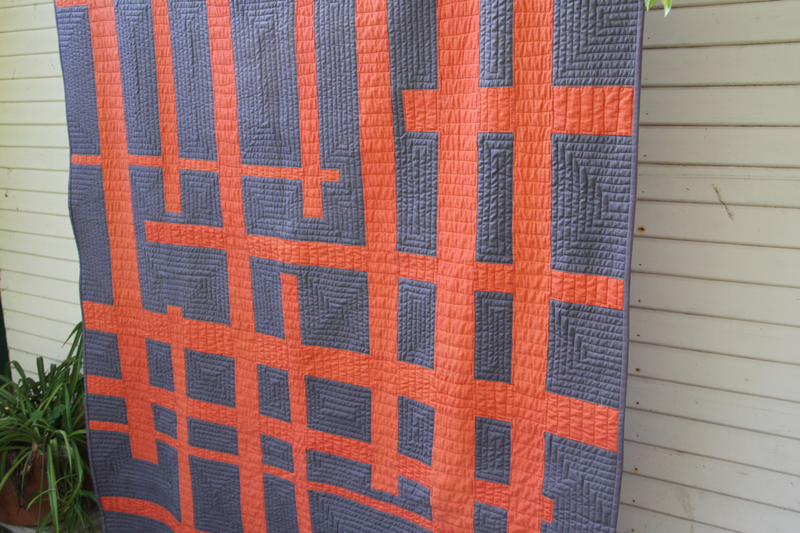 Straight-line quilting is just what it sounds like. Sewing through all three layers of your quilt sandwich in a straight line! It can be quite simple to do, or more involved depending on the complexity of the pattern you decided to quilt. Either way, there are tips and tricks that can help you out quite a bit. The primary thing you’ll need is a walking foot for your sewing machine. You can straight line quilt without one, but there’s no doubt that the quality of your stitches and your quilting will improve a lot with a walking foot. A walking foot has feed dogs on the bottom of it, so when combined with the feed dogs in your machine all three layers of your quilt sandwich are fed smoothly through your machine. Some machines have different feeding systems, so check your manual if it seems a walking foot is not an option. My Janome has an “accufeed system” that involves pulling a foot down into place, rather than attaching a separate foot. Another thing that you should check your manual for is if your machine has the ability to adjust your presser foot pressure. My first machine didn’t have this ability, and when I got a machine that did, it also improved my straight line quilting quite a bit. If your presser foot pressure is too strong, your fabric can shift slightly. 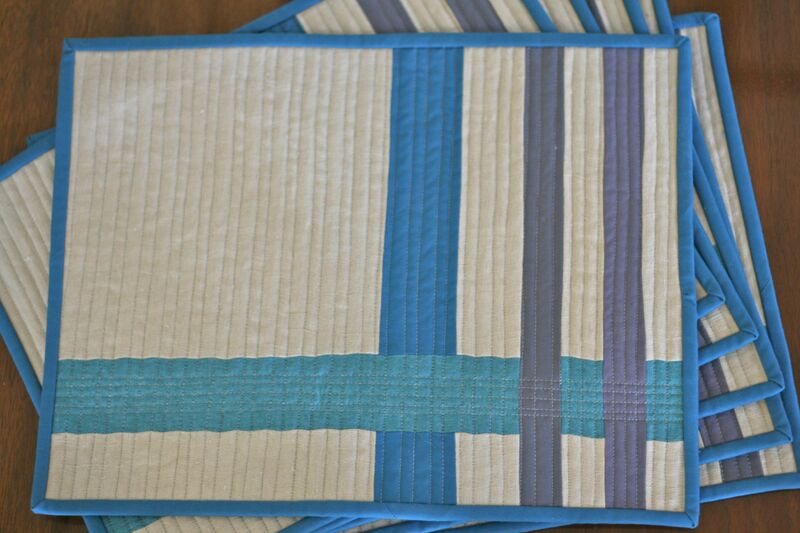 I used to alternate the direction in which I’d sew my lines so that this shift would be spread back and forth and back and forth again… You can see in the placemat below that the light blue fabric has a wiggle to it, caused by the fabric shifting slightly as I sewed each line. The fact that I used linen here also had an impact as it “sticks” to the batting less than cotton fabrics do. Now that I can keep my presser foot pressure lighter this issue has gone away completely. Another problem than can arise with straight-line quilting is when you want to sew across seams you’ve already sewn. Sometimes, as you approach a seam, fabric can bubble up to it, push against it, and create a pucker as you sew across it. Again, the pressure of your presser foot has a big impact on this but I also have found that if you anticipate it and literally hold the fabric in place, and nice and flat, as you sew up to a seam it can improve the problem. 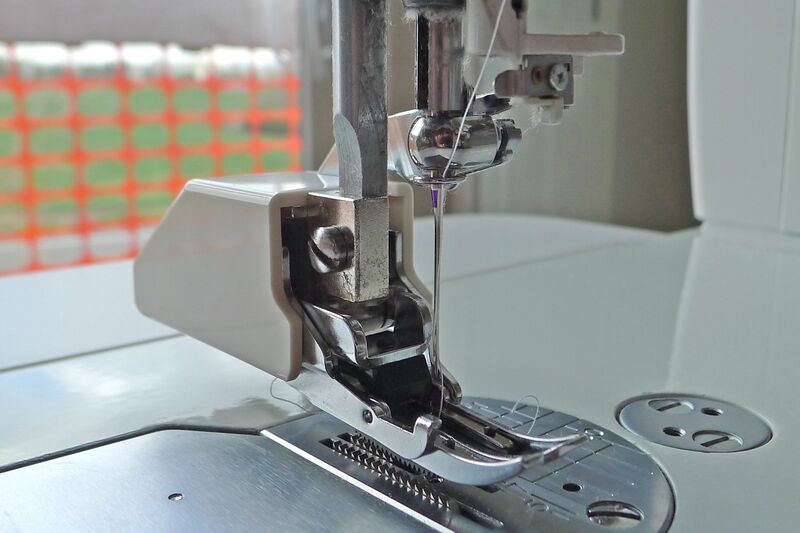 The more you get to know your sewing machine, the more you’ll know if these problems will arise for you and how to handle them. I recommend that when it’s possible, always work from the center out of your quilt. If you’re simply doing vertical straight lines along the entire face of the quilt, sew your first line right down the center of the quilt and then work your way out to the right. Then flip the whole quilt 180 degrees and repeat this process. If your quilting is more involved than this, think it though before you get started. This tutorial on my blog gives you an idea of what I mean. Also, if your quilt is very well basted and you’ve used a batting that the fabric “sticks” to really well (cotton batting for example) you don’t have to always start in the middle and work your way out. Sometimes the design simply doesn’t allow for it. Always take care that if you’re creating a situation where a portion of your quilt is getting surrounded by quilting, and you’re going to quilt that middle portion later, that the fabric in the middle is VERY well basted and is staying very, very flat. You don’t want rippling and bubbling in your quilted quilt top. For some quilts, you’ll want to fill in different portions or boxes. To do this, you can stop and start in the middle of the quilt, just be sure to sew locking stitches both at the beginning and the end of the lines you sew. One other thought: the bigger the throat of your machine, the easier it will be to turn your quilt through it. If you have a small machine and you’re quilting a bit quilt, lots and lots of square spirals might not be the route for you. Unless you have a lot of arm strength and patience! First of all, I’m just going to say it – I don’t care if my lines aren’t perfectly straight. I like the organic handmade feeling of lines that are imperfect and the big picture always looks much better than each individual line you sew. That said, you certainly don’t want them looking too messy! There are a few ways to keep them straight. If you quilt densely (as I often do) you can simply use the edge of your walking foot as the guide for each subsequent seam you sew. I tend to eyeball my first seam, but if it makes you more comfortable, draw it on with a ruler and a washable fabric pen or chalk and then you’re off and running! Another option is to draw on every line you sew, using chalk or a fabric pen. This can be time consuming and make sure it will wash out before you start drawing! Some people like to use tape as Jacquie has shown here. Finally, there’s the good old quilting bar. Check out this post by Kathy at Pink Chalk to see a great post about using it. Get some straight-line quilting done today! 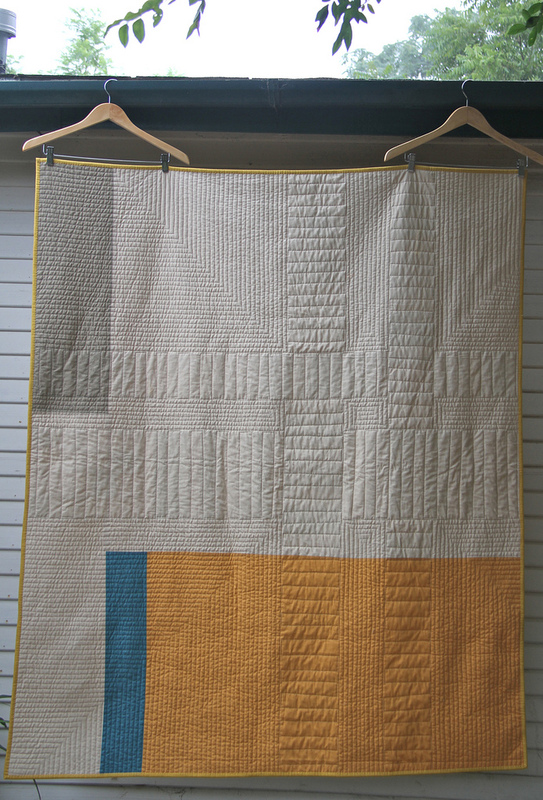 Depending on how densely you quilt it can be time quite consuming (take breaks! You don’t have to finish quilting all in one go!) but the end results are wonderful.